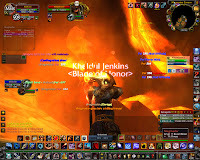 Hunter DPS: MC Trivia: What's Wrong With This Photo? It's a bit hard to make out. It was also hard to figure out when it happened. Give up? Check the comments. I didn't bother doing the hound packs. So I was tanking him in the far corner. Well. He feared me and my pet. My pet somehow went up the sloped wall pretty far. Mags went after him and ended up in some space above the ceiling. I could still dps him. I could still heal my pet. The light show was pretty nuts when he let loose with fire.